"Roll over, c'mon. You can do it." "Oh there you go, one foot, then the next...keep coming"
"Slow down, you're going too fast." Those three sentences, said by countless parents, carry a beauty that is indescribable. The joy, pride and upcoming panic occurs all at once as your child rolls all the way over, takes their first step and races around the playground at a pace that seems inconceivable when a child first enters this world. Yet from that first sprint to adulthood is where things get truly hectic for the kid. We think we need to go faster, we yearn to jump instead of run at a good pace and life becomes a sheer blur. Hi, my name is Yogi Roth and that happened to me. I was born. I rolled from my back to my belly and yes, I even walked. Then I began to sprint. As time sped up and adulthood was upon me my sprints began to feel like uncontrolled bursts at warp speed and the skill that was praised in my athletic career was now causing me to miss the simple joys that life offered. But one day those frantic and seemingly endless runs stopped. You see, my Dad was diagnosed with prostate cancer years ago and I quite simply didn't deal with it. So I stopped. I stopped racing and started walking, literally. 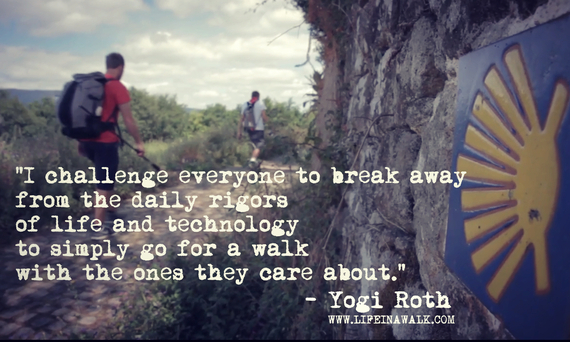 My Dad and I walked together along the Camino De Santiago in Portugal and Spain and even created a film about it called LIFE IN A WALK. Making the movie and seeing it impact countless people has been the most fulfilling and rewarding moments in my career. Yet that is not what has impacted me the most from this recent journey. It's been the little things. It's been the space between the screenings, much like the space between the notes during a great musicians solo. It's been the conversations with fathers and sons, mothers and daughters, partners and friends around the simple idea of spending the time with the ones we love. And it's been my growing curiosity. Last month, I sat next to my Mom while we watched my younger brother Ravi perform in "Fiddler on the Roof". Watching her follow his every move on stage with a glisten in her eye is a look that will be imprinted on my heart. Witnessing a tear stroll down her right cheek as she clapped with a pride I have yet to feel continues to create a tingle in my throat. But it was after the performance that influenced me most. With each step along the muggy streets in Salt Lake City my Mom described that she was not an immigrant but in fact, a refugee. For 34 years I thought she willingly left but in less than 34 minutes I learned she was forced out. At 3 she left Israel and at 7, she was forced to leave Germany for a new life in a place she never heard of, Scranton, PA. Her parents actually thought it was 'ScrantonPA,' as they didn't know what 'PA' meant. Where she was going, she had no idea as she walked with her small bags upon a massive ship. While crossing the Atlantic she daydreamt with other refugees, as her new life became closer by rise and fall of the sun. Upon reaching the United States she trusted her instinct with each step and as you may imagine, she hasn't stopped putting one foot in front of the other. Through the process of sharing LIFE IN A WALK I've learned that we've earned the right to live freely and ask our parents everything we desire. I've also learned how scary that can be in a culture that inheritably breeds a fear of failure. Yet in theatres across the nation and on the concrete of a small street outside of a theatre, I've also learned that we don't need to justify a 'walk.' We just need to take the first step, without fear or hesitation. Kind of like when we were a baby. Yogi Roth is a Filmmaker, Scholar, New York Times Best-Selling Author, accomplished Coach, , Pac-12 Networks Sports Analyst, Motivational Speaker, Media Personality, Host and World-Traveler. His newest film LIFE IN A WALK is out in theaters now via Gathr Films and will be available for purchase December 1st.